Is this Samsung's next Galaxy smartwatch? It's become pretty obvious that Samsung is prepping a new smartwatch and this could be our first proper look at the Samsung Galaxy Watch Active. 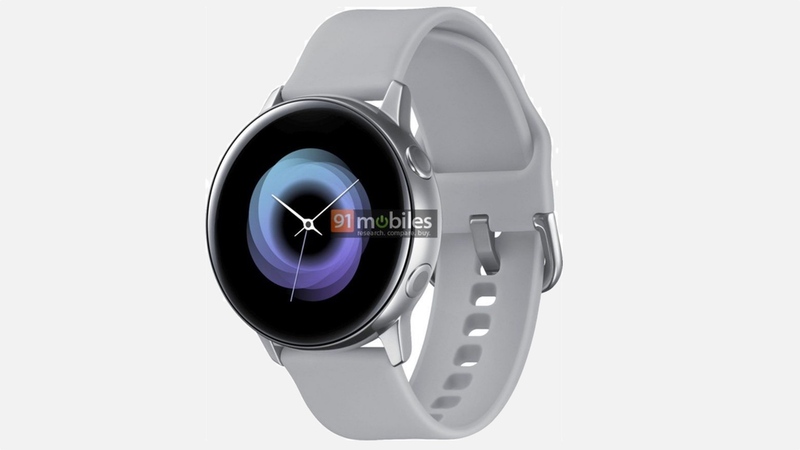 The folks at 91mobiles claim to have come across a render from a reliable source that appears to show a great likeness to the factory renders leakster @OnLeaks shared on Twitter last month and claimed was of the Samsung's next smartwatch. This time though, we have something in color. The render mirrors those earlier renders (below) showing off two physical buttons on the side of the device and what now looks like a slim stainless steel casing and a sporty strap with a watch-style buckle. There still doesn't appear to be any sign of Samsung's signature rotating bezel but again, we should reiterate that this may or may not be Samsung's next smartwatch. Other than the single render, there's no details on features this new watch will apparently show off. We also still don't know whether it's going to be called the Galaxy Sport or the Galaxy Watch Active. Previous rumor and speculation point to smarter Bixby support and maybe more health-focused features to follow in the footsteps of the Apple Watch and its introduction of ECG technology on the Watch Series 4. So, when could we see this new Samsung smartwatch? The company's Unpacked event takes place on 20 Feb where we expect its new flagship smartphone to be the star of the show. That new phone could be joined by a new watch and maybe even a set of Galaxy Buds and new Galaxy Fit and Galaxy Fit E fitness trackers too. We'll be at that Unpacked event, so we'll be sure to get our hands on them if they rock up.